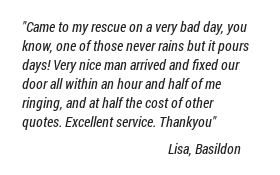 Here are just a selection of our customer testimonials. "We share our premises with another company RES-Info Tech and Ray organised the locks for the premises. I needed another set of keys. Well there's only one key, which opens both of the deadlocks on the main entrance." "Normally this involves a trip into town and standing around while the bloke actually cuts the keys on his machine. Not with these keys. Oh no. You just inform KAT that you want another key, they confirm with the person who ordered the locks in the first place and BINGO, the key is made. I just picked the key up at my convenience, which turned out to be very convenient." "Fast, effective, easy service. And, of course, you can always fall back on this service in an emergency. There's always KAT available with a spare key. Brilliant." "These keys cannot be cut elsewhere as they are code protected so a regular key-cutter cannot duplicate them or cut to the code. Spectacular security at a great price. I highly recommend KAT Master Locksmiths for your security needs." "We wanted to write to thank you. We are delighted with our new locking window handles." "Thank you also for taking the time to research the most suitable handles, knowing that our order wasn't quite as straightforward as it could have been, due to the manner in which the windows have to open/close and subsequently now lock." "You're fitter, young Sam, was a credit to KAT. He regularly called us with an update whilst waiting for our handles to arrive, then called again to book his visit to fit them. All-in-all, highly impressive." "We have no hesitation in recommending your expert services to others, having now experienced them first-hand." "I wish to sincerely thank you for the exemplary work you recently did for me." "You are aware we had previously received very unsatisfactory work from another person and you have restored my faith in locksmiths! Your work is first class, nothing is too much trouble and all is done with the minimum of fuss and such a pleasant disposition. Also, please pass my sincere thanks to Tracy, who is so helpful and an absolute pleasure to speak with." "Without hesitation, I will be recommending you and KAT Master Locksmiths to all my family and professional contacts going forward for a superb quality service and a person and business that can be totally trusted. Thank you." "Your representative, Sam, responded to my enquiry regarding a set of replacement locks for one of my lead-lighted windows. Quite a remarkable young man and I feel I must commend to you his professionalism and enthusiasm in the way in which he handled the whole situation - nothing too much trouble." "I feel he is an excellent ambassador to your company and I wish him well." "I have used KAT in the past for our own business requirements, and was very pleased with the efficient and prompt services provided." "The detail and time spent measuring each door and correctly choosing the lock size required upon the site visit was impressive, so too was the fitting service a few days later after the bespoke keys and locks were arranged." "The cost was a small amount to pay for the peace of mind the new locks gave, the best on the market that cannot be copied and easily broken into." "The service from start to fitting was exemplary, professional and quick considering, and we are very please with the outcome. Thank you KAT Locksmiths, I wouldn't hesitate to recommend their service to all and will continue to use them for the future." "Young man arrived reassured me he could open the door - did so - very quickly - No Damage." "He attended within 10 min call out, exceptionally polite, positive and helpful. Would thoroughly recommend Company. Excellent customer service." "I am writing to say a big thank you to you and your team - from the moment of my call to you after unfortunately finding our home had been broken into you were friendly helpful informative and very efficient - having Sam come round in what must have been under 10 minutes to assess and carry out fitting new locks, and returning to make sure the doors were aligned. I would have absolutely no hesitation in recommending your company. A big thank you once again." "Just a note to thank you for the quality of service provided by your shop over the last week. On moving into a new house we found the locks to be variable in usability. Jamie sourced a new replacement mortise lock for us and provided sound advice on updating other locks. Despite spending considerably more than I intended the quality of service provided has resulted in me being a very happy customer. I will have no hesitation in recommending KAT to others." "Thank you for excellent work. I was really pleased to find out and confirm just how professional your services at KAT Locksmiths were. The speed in which you reacted to my lock change was outstanding!" "I will have no hesitation referring you to my clients and look forward to using your services again." "Just to let you know that I popped in today and saw your colleague (Sam I think) he sorted my replacement car key and a couple of other keys. Excellent service he was cheerful and really helpful!!" 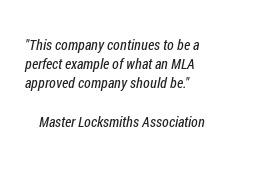 "This company continues to be a perfect example of what an MLA approved company should be." "An excellent service. 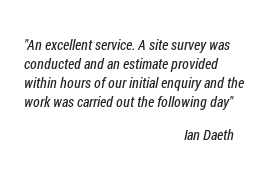 A site survey was conducted and an estimate provided within hours of our initial enquiry and the work was carried out the following day." "Excellent service, very efficient, would not hesitate to recommend to others." "I have had Tony round twice in the past month. Our key broke in our lock - I rang KAT and Tony arrived within 20 minutes. He dealt with the broken key and changed our barrel at our request easily and efficiently. We recommended him to my brother and they used him for their locks. Tony then came back on our request to fit a deadlock. We found Tony to be efficient, friendly and did a fantastic job, we would recommed him again." "Very Pleased - A Prompt, efficient and friendly service. A big thank you." "Thankyou for your very efficient and friendly advice yesterday when inspecting my elderly relatives obstinate doors. I obtained your details via Age UK and Essex County Council Tried and Tested Numbers and will be conveying to them my satisfaction." "Came to my rescue on a very bad day, you know, one of those never rains but it pours days! Very nice man arrived and fixed our door all within an hour and half of me ringing, and at half the cost of other quotes. Excellent service. Thankyou"